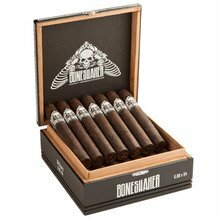 The newest size from the Boneshaker line, the massive 6 inch by 60 ring gauge War Hammer, may sound intimidating but it's actually a very refined smoke that's full of strong and robust flavors. The enjoyable tastes of coffee, chocolate, and coffee quickly take a back seat to a symphony of bold, delicious flavors of earth, cinnamon and tangy spice. Not for the weary, this affordable stick is just begging to accompany an ice-cold brew and a juicy steak. Exclusive to JR Cigar, you can get a box of 20 right here. 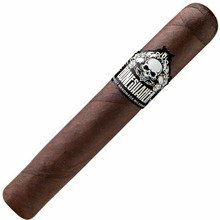 War Hammer is a consistent and flavorful smoke. I will continue to buy more. Same flavor every time meeting expectations. Sometimes we all make boastful claims, but after smoking well over a thousand of these, it beats La Gloria Series R. For half the price. I see some negative reviews below, and it can happen, overheated in shopping, bad box, etc., but overall these are amamzing colors hats. Give them one week (two is perfect) in a Ziplock with a humipack 69%. So far I haven't had anything from boneshaker I haven't enjoyed. War hammer is a great daily smoke. The war hammer has a very bold taste. Excellent flavor very nice draw. Burns very nice. Definitely recommend. I think a good comp to this cigar is the CAO flathead V660 Carb, I think this cigar honestly is better and half the price. This thing is a hidden gem. Highly recommend. Delicious, full bodied cigar that got my attention right away. All of the good qualities. No doubt a strong flavor profile with super construction and burn. The aroma rivals any premium cigar. Will order more. Good, dark cigar with nice flavor and sound construction. Not my absolute favorite, but a solid addition to my humidor. Don't run away from this, it's something to try. This Cigar gets high marks from me personally, it a palate please, and a lot of bang for the buck. It is a Cigar I would tell people, "don't let the price point scare you to think it junk'. It a hidden gem, try some to find out. If you like a stronger cigar with a long burn time, this is the one for you. Good construction, an easy draw, and reasonable price make this one a keeper. Even better when you can catch it on sale. You can't find or buy a better cigar for under $100 today. 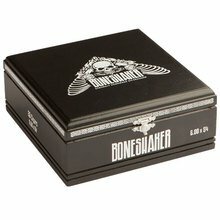 Boneshakers are an exceptional burn from the first buff till the last finger burning draw. Love this cigar, strong, even draw, tasty and long lasting. Will buy again and again. Love the cigar. Great smoke.